Runners brave wet Saturday to run in 5K race. About 10,000 people from all over the world took part in the 11th annual Bostan Athletic Association's 5K race Saturday morning in Downtown Boston. 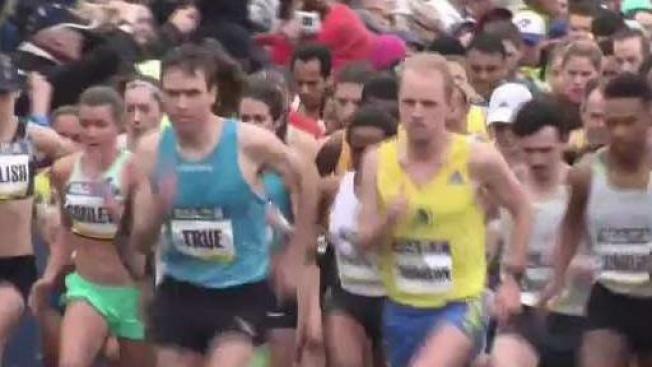 The race kicked off in Boston Common with runners of all levels and abilities. “It’s an amazing event and I feel super honored that my family came,” said Alicia Lakey who traveled from Edmonton, Alberta, Canada to participate in the race. Erwin Haberda traveled to Boston from Austria with his friend to run in the 5K and the Boston Marathon. “60 to 80 K per week so it’s a lot of training and it’s necessary because 26 miles is a long way,” Haberda said. Cheryl Mishel is from Lynn and is running the 5K for the first time. “It’s as much is I can run,” she said. Many people participated in the race for different reasons. “We are raising funds for to raise awareness for domestic violence,” said Amy Buscaino of the Ersilia Cataldo Matarazzo Fund, which was started in honor of her late sister Ersilia Cataldo Matarazzo. The race is even more special for medical School Student, Alicia Lakey, who is visiting Boston from Canada. The race was the first time since having an Ewing amputation that she had run on her new prosthetic leg. She’s got support from the Stepping Strong Center, which raises money for trauma research and recovery. “It was amazing. Everyone was cheering and it felt really good,” Lakey said. “This is the first race that I’ve actually run a part of,” said Brandon Korona, who is a military veteran and amputee. Korona also raced with the Stepping Strong team from the Stepping Strong Center. “It’s just so exciting to see old faces coming back and new faces join each year,” Reny said. No matter the reason, the goal is the same. “I cross the line holding my brother and my mom‘s hand and it was just really special,” Lakey said. The Boston Marathon takes takes place Monday.